Male, born in 1972. He graduated from Shanghai Maritime University, major as Shipping and obtained Doctor Degree of Management from Fudan University. He had served in Senior Management team of Shanghai Airport Authority, Shandong Shipping Corporation and several national shipping enterprises. 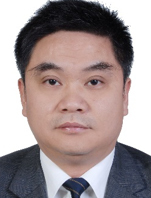 With professional shipping background and almost ten-year's experience in Logistic industry, he has a wealth of experience in trading, chartering and ship building projects, and has accurate judgment and orientations on global shipping market.